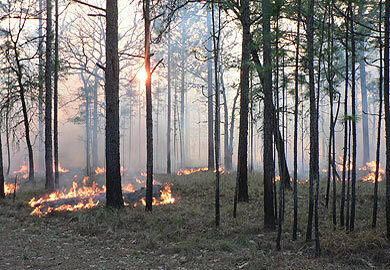 The Red Flag Fire Alert in force since Saturday morning is now lifted by the South Carolina Forestry Commission. Fire managers ended the Red Flag Alert based on improving weather conditions. Calmer winds and higher relative humidity values mean fire is less likely to spread. However, the Southeast is in the midst of wildfire season and care should be taken with all forms of outdoor burning to prevent wildfire starts. During the Red Flag Alert, SCFC personnel responded to 51 fires statewide. No injuries have been reported. Some local jurisdictions may have yet to lift a burning ban. Check with local fire officials before conducting any type of burn. SC law requires anyone planning to conduct debris burns or controlled burns to notify the Commission in advance. The South Carolina Forestry Commission is issuing a Red Flag Fire Alert effective Saturday for the entire state. Weather conditions, which include sustained winds (20 to 30 mph), wind gusts (30 to 40+ mph), dry fuels, and low relative humidity, contribute to an elevated fire danger level. Traditionally, outdoor activities increase on weekends and lead to fire starts. This is an important consideration in the decision to fly the SCFC Red Flag. A Red Flag Fire Alert does not outlaw debris burning in most unincorporated jurisdictions, but it is an advisory which strongly encourages South Carolinians to postpone burning. Nearly half of all wildfires in our state begin as escaped debris burns. Some local ordinances do ban burning during a Forestry Commission Red Flag Fire Alert. Check with your local fire officials to determine how a Red Flag impacts your community. The weather forecast suggests that conditions may moderate on Sunday. SCFC fire managers will continually evaluate the situation over the weekend. This alert remains in effect until lifted by the South Carolina Forestry Commission.